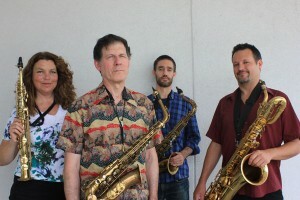 Kingerama at the Inkwell Cafe on Friday, December 12, 7-9 pm: Carole King’s songs played by the Broken Reed Saxophone Quartet in startling arrangements by Charley Gerard. Performers are Charley Gerard, Jenny Hill, Dimitri Moderbacher and Jacob Teichroew. “Broken Reed is anything but broken. Their sound is full-bodied, harmonically strong and appealing, fresh, lighthearted, festive and yet complex and serious. This is a remarkable group.”–Dr. José E. Cruz, President, Jazz/Latino, Inc. The artistry and talent of the individual members of the Broken Reed Saxophone Quartet have been heard at the Blue Note, the Kennedy Center, and jazz festivals around the globe, performing with Aretha Franklin, Norah Jones, the Diva Big Band and Washington Musica Viva. $5 suggested donation supports the performers and PLG Arts. The Inkwell is located at 408 Rogers Avenue, between Lefferts Avenue and Sterling Street.